Beautiful use of the lens to make the sky look like a magnet for the buildings as well as the eye. The mackerel clouds are perfect in more than one way. I had to look this one up. Why a chapel built practically on the beach? Turns out it was built to replace the previous fisherman’s chapel and associated pier that were both causing the harbour to silt up. In between the fisherman worshipped in the main church and growing concern about the fishiness of their persons spurred construction of this chapel. Same as it ever was. Site Description St Julian’s church is situated south of the harbour, at the very edge of the beach and to the north of Bridge Street. It was built in 1878 as a fisherman’s chapel to replace a chapel on the pierhead dedicated to St Julian (and dating from at least 1539). The present church was designed by William Newton Dunn and opened 1/12/1878, the cost largely met by a Miss Forde who had paid for the Fishermen’s Rooms adjoining. It is constructed of grey limestone rubble with Bath stone dressings and a slate roof. It comprises a small single chamber in lancet Gothic style with hoodmoulded single lancet windows with iron lattice glazing except where stained glass has been introduced; the entrance is in the west gable. The interior is simple with exposed rubble stone walls under a boarded three-sided roof and decorated with fishing gear. Memorial windows were put in to designs by Joseph Bell of Bristol in 1881 and 1900, and another in 1923. Renovations were planned in 2014. I had to look up the location of Tenby. Love the colorful buildings. Are they typical of the area? 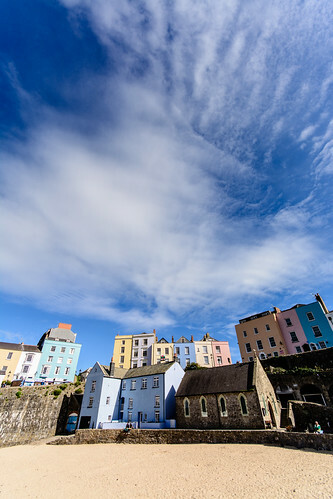 Not especially, away from the coast there are mainly stone cottages and farmhouses, but Tenby has been a resort town since forever.